So begins the sorriest part of David’s life. Until now, he exercised faith in pursuing God and God’s will. But one spring, when his duty was to lead his armies in war, he decided to stay home in Jerusalem. What led to David’s decision to stay behind? Was he tired of war? That would be understandable. But he still had his duty. Was he feeling entitled? That can happen when we reach a certain age. But we still have our duty. Did he feel that the armies could do well without him, that he had trained them well enough? Maybe. But it was still the duty of kings to go to battle with their armies. God has made each of us part of families, communities, nations. We are called to love God and to love others. This will first be expressed in the networks of relationships I have with my family, community, and nation. What’s my duty to them? When I am baptized, I become part of another community, God’s eternal family, the Church. In the Church, as Christ’s disciple, per Jesus’ new commandment, I am called also to love my fellow believer as Christ has loved me, with sacrificial love that puts the interests of others over my own. David’s dereliction of duty, while forgiven by God, had horrible consequences. So what happened that spring when David should have been with his army but stayed behind in his royal home? He got up from his bed one night (2 Samuel 11:2). (Was he unable to sleep? Did he have a conscience that was pricking him? We don’t know.) While walking on the roof of his home, he caught sight of a woman bathing, Bathsheba. Problem #2: Bathsheba became pregnant, while her husband, Uriah, was off to war. The problem with the sinful avoidance of one’s duty is that, as it creates more problems unless you bring it all to God with repentance and faith, it only leads to more sinful avoidance of one’s duty. That’s when David hatches another plan. He enlists his field commander as a co-conspirator to ensure that Uriah is killed in battle. That way, David could bring Bathsheba into his house as his wife. Clearly, that hadn’t been David’s original plan, but it would, he thought, let him save face. 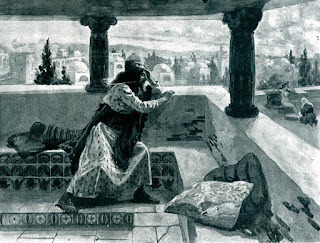 Until the prophet Nathan confronts David for his sin. Nonetheless, there are times when sin has its consequences. God’s grace is such that whether the world catches us out or not, He will forgive the repentant. But our sins, even the forgiven ones, may set consequences in motion over which we have no control. The child he had not wanted died, bringing grief to both Bathsheba and him. A second child was conceived, Solomon. Bathsheba, who probably never loved David, would scheme and connive to put Solomon on the throne, making David the object of palace intrigue. Solomon would become Israel’s most powerful king, but he would also spiritually destroy Israel, introducing the worship of deities other than the world’s one true God Who had called Israel into being. All this happened because David failed to do his duty. None of this should be interpreted, of course, as saying that David, in failing to do his duty, was failing to earn his salvation. THAT’S NOT THE WAY GOD WORKS! We are saved by grace through our faith in the God Who has, since the days of David, been definitively revealed in Jesus Christ. Believers are called to do their duty NOT as a means of gaining forgiveness and new life from God. We’re called to our duty of loving God, loving neighbor, and loving fellow believers IN RESPONSE TO THE FACT THAT THROUGH JESUS AND OUR FAITH IN HIM, WE ARE ALREADY SAVED FROM SIN AND DEATH! The doing of our duty then becomes a way of expressing gratitude for unmerited grace: the gifts of forgiveness, new life, and purpose that belong to those who trust in Christ. For this, I repent. And I ask God the Father, in the name of Jesus, to help me do my duty “...heartily, as for the Lord and not for men…” (Colossians 3:23). Because, in the end, in all my duties and relationships, whatever good I do, I really do it for the God I know in Christ. God loves me in spite of who I am and what I often do. That should be reason enough for me to do my duty. God, forgive me when in my fussy selfishness, Your grace doesn’t seem reason enough to do my duty to You and to others. And when I “lose my mind,” forgetting what I know of You and Your grace, restore me to reason and gratitude to You, Lord. Create in me a pure heart, O God, and renew a steadfast spirit within me. Do not cast me from your presence or take your Holy Spirit from me. Restore to me the joy of your salvation and grant me a willing spirit, to sustain me.